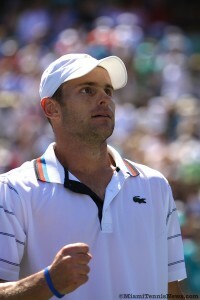 Andy Roddick is scheduled to play in the 2011 International Tennis Championships in Delray Beach, Florida. 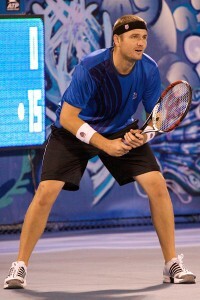 Roddick will join fellow Americans Mardy Fish, John Isner, and the Bryan brothers at the ATP World Tour event to be held February 18 – 27, 2011. DELRAY BEACH, FL (www.YellowTennisBall.com) – Andy Roddick is coming back to “The Beach.” The former Boca Raton resident and 2003 US Open champion will return to the tournament where he made his pro debut when he plays in the 2011 Delray Beach International Tennis Championships (ITC) ATP World Tour event next February. Roddick’s signing was announced Thursday as the Delray Beach ITC was accepting the 2010 Providencia Award from the Palm Beach County Convention and Visitors Bureau for its lead role in contributions to the area as a tourist destination. 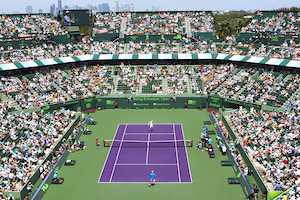 The 19th annual Delray Beach ITC will be held Feb. 18-27 at the Delray Beach Stadium & Tennis Center, and will include both the ATP World Tour event alongside the 2nd annual ATP Champions Tour event featuring John McEnroe. To celebrate Roddick’s signing, the ITC is running a discounted ticket promotion from October 1 -17. All single session reserved seats are 20% off (reg price $35-$85) while single session box seats are 10% off (reg price $65-$85). Reserved series ticket packages are also discounted 10%. Fans can order online through www.YellowTennisBall.com or by calling 561-330-6000. Roddick’s 2000 pro debut began a string of four appearances in Delray Beach. The Boca Prep grad reached the 2002 ITC final, and by season’s end became the youngest American to finish in the Top 10 since Michael Chang in 1992. The Grand Slam champion became the youngest American to finish No.1 in the world when he achieved that ranking in 2003 as a 21-year-old. He has finished in the ATP’s Top 10 for eight straight years and enjoyed a five-year run in the Top 5 during that time. Roddick is a three-time Wimbledon runner-up, a 2006 US Open finalist, and has won 29 ATP titles in 10 years as a pro. His 41 US Davis Cup singles wins ranks second all-time behind McEnroe. Roddick joins 2009 ITC singles champion Mardy Fish and Wimbledon record-setting John Isner in committing to play in the ITC’s ATP World Tour event, setting up a draw with three of the top four-ranked American singles players. Also returning to Delray Beach are the ITC’s defending doubles champions and world No.1 Byran Brothers while the ATP Champions Tour event has already received commitments from McEnroe, Mats Wilander, Pat Cash,Mark Philippoussis, Greg Rusedski and, most recently, Boca Raton’s Aaron Krickstein. McEnroe, Wilander, Cash and Krickstein played in the inaugural event in 2010. ATP World Tour action; the $290 (reg price) Champions package (sessions 1-9) combining all ATP Champions Tour matches and four ATP World Tour sessions; the $390 (reg price) World package (sessions 6-18) giving fans all ATP World Tour matches plus two days of ATP Champions Tour matches (including the final); and the popular $200 (reg price) Weekender package including tickets for the ATP World Tour quarterfinals, semifinals and finals (sessions 14-18) . The ON-COURT “Best Seats In The House” are priced between $150 and $250, depending on the session. All ticket opportunities, prices and amenities are explained in detail at www.YellowTennisBall.com. For more information, please call the tournament office at 561-330-6000. Once more, the Florida swing of the ATP initiates with the Delray Beach International Tennis Championships. Along with the 250 World tour event which takes place from February 22 thru 28; for the first time, the Champions Tour comes to Delray with play running concurrently from February 20 thru 23. Heading the line up from the legends tour are multiple major winner John McEnroe, two time U.S Open champion Patrick Rafter, fellow Aussie and 1987 Wimbledon victor Pat Cash, holder of seven majors Mats Wilander, 1990 French Open winner Andres Gomez and Johan Kriek two time Australian Open titlist. From the World tour, 2009 champion Mardy Fish returns seeking to become the first individual since Jason Stoltenberg in 1996-97 to defend. Fish will face stiff competition from top seed Tommy Haas winner in 2006, second seed and serving giant Ivo Karlovic, two time finalist James Blake and two time champion Xavier Malisse. Wildcard youngster Kei Nishikori who stunned Blake in the 2008 final has again been given a wildcard entry. On the doubles side, the top attraction are Mike and Bob Bryan who are on the hunt for their second straight title. Come out to see today’s stars as well as those of yesteryears. 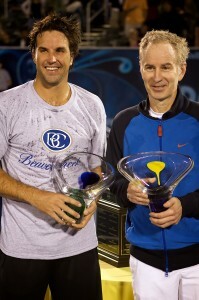 For more info on the tournament and to purchase tickets go to www.yellowtennisball.com or call (561) 330-6000.